Foreign and Expatriates Ministry on Monday sent two letters to the UN Secretary-General and President of UN Security Council regarding the persistence of ISIS, Jabhat al-Nusra, and other terrorist organizations in committing crimes against civilians in Syrian cities. The Ministry said that terrorist organizations are targeting Syrian cities with suicide bombing and arbitrary shelling in a bid to disturb the state of tranquility and stability which had prevailed in several Syrian cities that witnessed successful national reconciliation efforts in recent days. The letters asserted that this terrorism is the result of the open and generous support in funds, arms, and munitions provided to terrorists by states like Turkey, Saudi Arabia, and Qatar, who are complicit in the terrorist attacks carried out against the Syrian people. 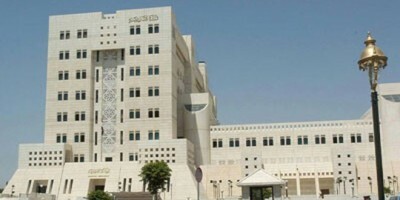 Foreign Ministry went on to say that on Monday, terrorist explosions took place in the cities of Aleppo and Homs, claiming the lives of many civilians, while the terrorist gangs of so- called “Jaish al-Islam”, sponsored by Saudi Arabia, targeted Damascus city with different forms of mortar and rocket shells. The ministry added that on Monday morning, terrorists blew up an explosive device in a car in al-Zahraa neighborhood in Homs city; saying that the explosion was followed by another attack with an explosive belt that went off amid the crowds of civilians and members of civil defense and medical teams who rushed to the place to rescue the wounded civilians. The two explosions claimed the lives of 19 civilians while 43 others were injured. The letters affirmed that today’s attacks come after many terrorist bombings, most recently, an explosion which targeted medical clinics on Saturday December 12th, killing 16 civilians and injuring 54 others and causing massive material damage to private and public properties. The ministry said that the terrorists on Monday also targeted Aleppo city with various shells, killing 11 citizens, including a child and injuring more than 40 others, 11 of them are in a critical condition. It added that Government of the Syrian Arab Republic affirms that terrorism which has targeted Syrian cities and villages for more than four years, is an outcome of support provided by countries like Turkey and Saudi Arabia to terrorist organizations, in a flagrant violation of UN Security Council resolutions, mainly No. 2170, 2178, 2199 and 2253. The ministry said that the continuation of US, Britain and France, which are permanent member states at UN Security Council, in preventing the council from adopting stances that condemn those terrorist crimes encourage terrorists to mount their attacks and reflect the non-seriousness of these countries in the fight against terrorism. It concluded by saying that the Syrian government, while affirming its commitment to combat terrorism and assume its constitutional and legal duties to protect its people and sovereignty, calls on Security Council and UN Secretary-General to condemn the terrorist acts and assume responsibilities in combating terrorism.